Equipping Africa’s small business owners with the tools to succeed. A business is only as good as the infrastructure and equipment it relies on. In Sub-Saharan Africa, smallholder farmers and shop owners are often unable to grow beyond a certain point because they have scaled to a level where their operating infrastructure is no longer effective. Buying improved assets is often the key to increasing profitability. Rent to Own equips small businesses with the resources to graduate beyond early stage operations. Through tailored financing, training, identification, delivery and installation of vital assets, and an innovative approach to collateral, Rent to Own provides small-scale entrepreneurs with the tools to succeed. To date, the venture has increased business incomes by $1.4 million USD. Rural business owners in Sub-Saharan Africa often lack access to affordable, available and appropriate equipment for key activities such as farming and food production. Stunting these essential social initiatives can hamper the development of entire communities. Many entrepreneurs lack the necessary prerequisites to acquire new assets to advance their operations. This can include a lack of financial profiling, poor record keeping, unfamiliarity with technology or equipment developments, and more. Access to simple irrigation systems for farmers, eliminating the effort involved in wells and buckets. Purchase and delivery of a glass display refrigerator for grocers, to better display and maintain food products. The venture enables smallholder farmers, service businesses and shop owners to increase their productivity and profits over the long term. The enhanced local business capacity eventually ripples throughout the community. As entrepreneurs prosper, they create improved employment opportunities and living conditions for the wider population. In order to support Rent to Own throughout the vital middle developmental stages, EWB reinforced the venture in its founding-stage by embedding Five Long-Term Fellows and eight Junior Fellows. Additionally, EWB supplied initial equity and convertible debt to facilitate more rapid and realizable growth. Conduct essential research and development through the venture’s early founding stage. Source data relating to the Rent to Own operating model to test its ongoing viability. Engage in service development, market research and impact assessment. Set up early operating infrastructure to support the business, including client information management systems and customer relationship management software. Support and equipment to ignite business impact. Rent to Own is more than a simple loan repayment initiative. It is a multi-pronged approach designed to trigger business growth through productive asset procurement. From delivery of equipment and tools to finance training, the Rent to Own model ensures that small business entrepreneurs receive the assets, skills and practical knowledge they need to grow. The approach is tailored to the requirements of specific sectors. Understand and catalogue new equipment developments across various markets. Customise financing to accommodate the seasonal cash flows of certain industries. Outline individual businesses before the application begins, to better understand each client’s business plan and their repayment capacity. Offer productive assets at low prices. Cataloguing and identification of durable, affordable technology. By using a catalogue and cloud-based operating systems instead of costly product inventories, Rent to Own ensures clients can efficiently compare and contrast options when selecting equipment. Asset financing is tailored through an understanding of each business’s capacity. For example, a baker might make a 10 percent down payment on a new baking oven, then use the income from the increased profitability of the business to pay the remainder of the cost in monthly instalments. Delivering assets to the business and any on-site installation. To-the-door delivery eliminates the difficult logistics associated with product sourcing and equipment installation in rural Zambia. Training on operation and maintenance. 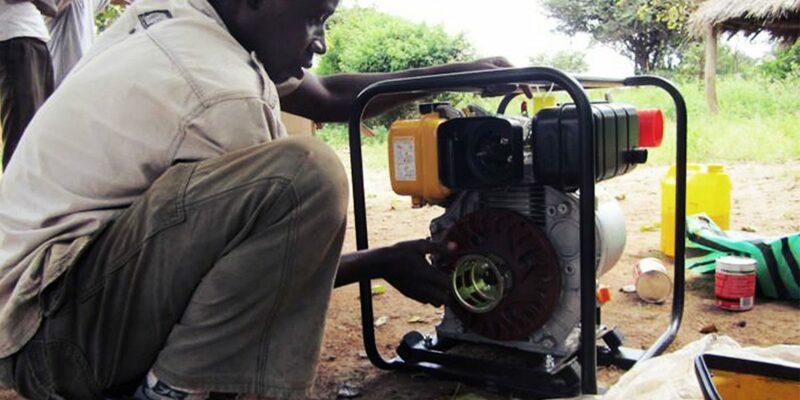 Continual maintenance and upkeep training ensures equipment continues to earn entrepreneurs a sustainable income, long after the initial Rent to Own engagement is complete. On average, Rent to Own clients receive ongoing benefits for three years after the initial engagement, with an average increase of income of $683 per year. The average annual income in Zambia is around $4,100 USD, representing yearly growth of 16.65%. Catalyzing ongoing capital for sustainable growth. In the years since our early involvement, Rent to Own has secured investment from a range of philanthropic organizations, including the Lundin Foundation and Jordan Engineering. It has also received 3 year’s worth of grant funding from the African Enterprise Challenge Fund. Rent to Own has also established a partnership with KIVA. The organization is an international non-profit platform connecting micro-finance lenders from around the globe to foster small-scale innovation. Establishing a network of social development partners. Today, Rent to Own is supported by a range of international social, corporate and development organizations. Drawing on the expertise and resources of a diverse global network is fostering rapid service refinement. Growing to employ over 30 full-time staff. Improved business performance often filters throughout a wider community in the form of increased employment prospects. This is true of Rent to Own, a business that has grown from two employees to more than 30 in just eight years. Providing over USD $1.75 million in micro assets. Assets have included micro-irrigation systems for farmers, power generators for hotels and retail shops, fridges, freezers, baking equipment and more. Ongoing benefit for over 1,000 individual businesses. As a result of asset based financing, Rent to Own directly improves the livelihoods of smallholder businesses. Over 2,500 people in rural Zambia have been directly impacted by the work of the Rent to Own venture and the numbers continue to rise.